Prestashop Flipkart Connector : With our Prestashop Flipkart Connector module, admin can easily export their products from prestashop store to flipkart thereby augmenting product sales taking advantage of larger customer visits on Flipkart. Higher Customer Access, Higher Sales, Higher Revenue ! Prestashop Flipkart Connector : - Connect your Prestashop Store with India's biggest online ecommerce store - FLIPKART! With our Prestashop Flipkart Connector module, admin can easily export their products from prestashop store to flipkart thereby augmenting product sales taking advantage of larger customer visits on Flipkart. Higher Customer Access, Higher Sales, Higher Revenue ! Export Products from Prestashop to Flipkart. Export Products from Prestashop One by One. Export Products in Bulk using Bulk Export Feature of the module. Set the Listing Status of the Product to be exported – Active or Inactive. Specify the Stock level of the Product to be exported. Specify the Delivery charges of the Product to be exported – National, Local and Zonal. Mention the Product dimensions and weight of the Product to be exported. The module will not only help in exporting products to flipkart but will also help in updating the exported products. Export products one by one from Prestashop to Flipkart. Export products in bulk from Prestashop to Flipkart. FSN Number (Flipkart Serial Number). HSN Number (Harmonized System of Nomenclature code used for GST). Listing Status of the Product to be exported – Active or Inactive. Stock level of the Product to be exported. 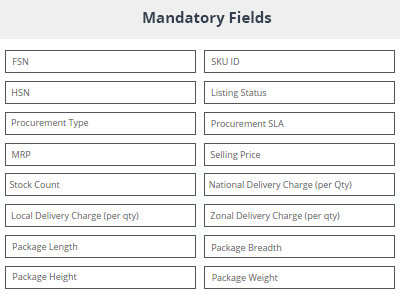 Delivery charges – National, Local and Zonal. Did you buy Prestashop Flipkart Connector?